Let's Not Go to Hell. • Song of Songs 2: 8-14. • Psalm 33: 2-3, 11-12, 20-21. 8:26 AM 12/21/2017 — Two options are presented by the Missal for our first lesson today: one from the Song of Songs, and one from the Prophet Zephaniah. The poet in me would have chosen the first, but the priest in me has chosen the second, only because it it speaks to the reality of discouragement and hope … and I hear a lot of confessions. 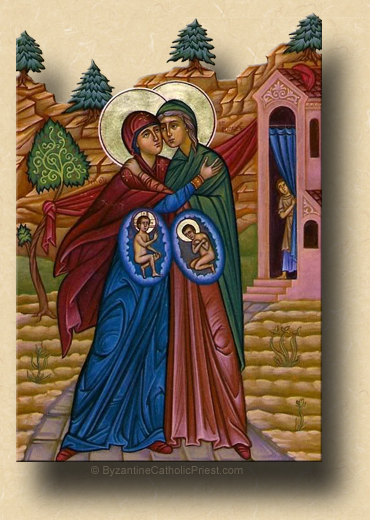 As to the Gospel lesson: we’ve spoken about it before, and need not do so again, except to recognize that the reaction of the Baptist to his Divine Cousin in the womb of our Blessed Mother is a terrible condemnation against anyone who still mistakenly believes that the child in the womb is not a human person. On this fifth day before the celebration of our Lord’s birth, let us pray for the souls of the unborn who have died, for the forgiveness and healing of those who have committed this terrible sin, and for the conversion of all those who have placed their souls in jeopardy because they have supported the murder of unborn children. Any memorial, optional or otherwise, falling within the Days of the Greater Antiphons, which constitute a privileged season, automatically becomes a commemoration, the observance of which is optional. Only the Collect may be used, with everything else taken from the feria; the color of the season is worn. More detailed information about commemorations in privileged seasons in the ordinary form can be found here. Born in Holland, the Jesuit Peter Canisius lived for many years in Germany where he defended the Faith by writing and teaching. He founded several Catholic colleges, and his Catechism was published in fifty-five editions in nine languages. ** In the extraordinary form during a privileged season, whenever a feast of the 1st or 2nd class occurs, the feria is commemorated by adding the Collect, Secret and Postcommunion of the feria to those of the feast. The commemoration is made at Lauds and Vespers by adding an additional antiphon, verse and Collect to those of the feast.